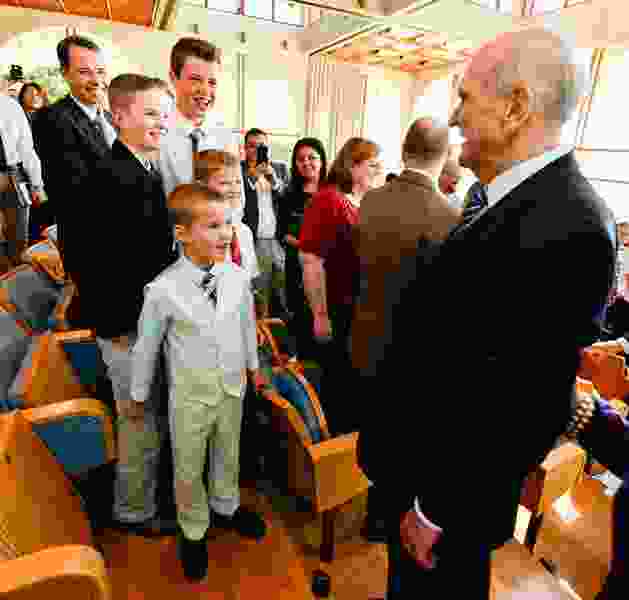 (Courtesy LDS Church) LDS Church President Russell M. Nelson greets attendees at a district conference held at the Brigham Young University Jerusalem Center, April 14, 2018. LDS Church President Russell M. Nelson was in Jerusalem this weekend for the second stop on his world tour, but left ahead of schedule due to “concerns pertaining to tension in the region and available airspace,” the Utah-based faith said Saturday. The 93-year-old Mormon president and his wife, Wendy, along with apostle Jeffrey R. Holland and his wife, Patricia, began “the Africa portion of this trip sooner than planned,” spokesman Doug Andersen said in a statement. The United States, France and Great Britain launched airstrikes in Syria early Saturday in retaliation for a reported chemical weapons attack by the Bashar Assad regime. Nelson left Utah on Tuesday for an 11-day, eight nation trip, addressing Mormons in each location. The entourage stopped first in London and then in the Holy Land, where Nelson addressed a “district conference” of members of The Church of Jesus Christ of Latter-day Saints. 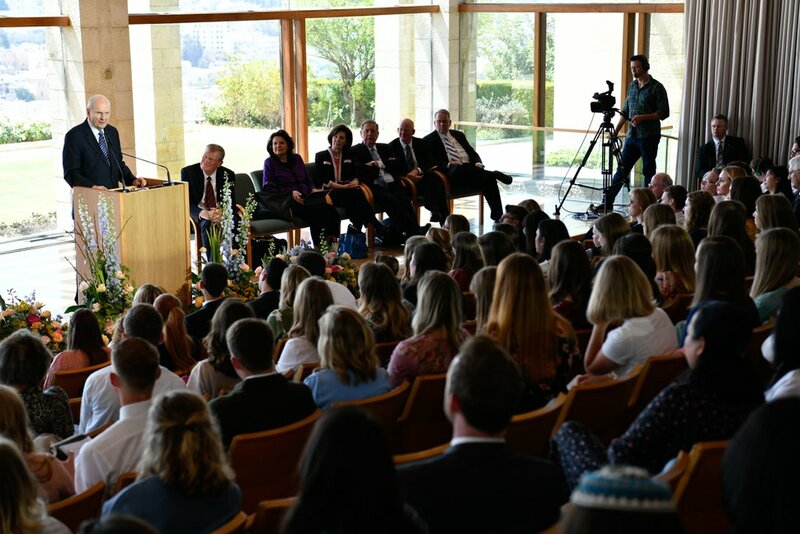 (Courtesy LDS Church) LDS Church President Russell M. Nelson speaks in Jerusalem from the BYU Jerusalem Center April 14, 2018. The visit is the second stop on his global ministry tour. Holland, a former BYU president who played a key role in establishing the Jerusalem Center, noted the symbolism of Nelson’s presence in the city of biblical importance. Nelson’s next stop is Nairobi, where he will participate in a meeting that will be broadcast to Mormons in Kenya. 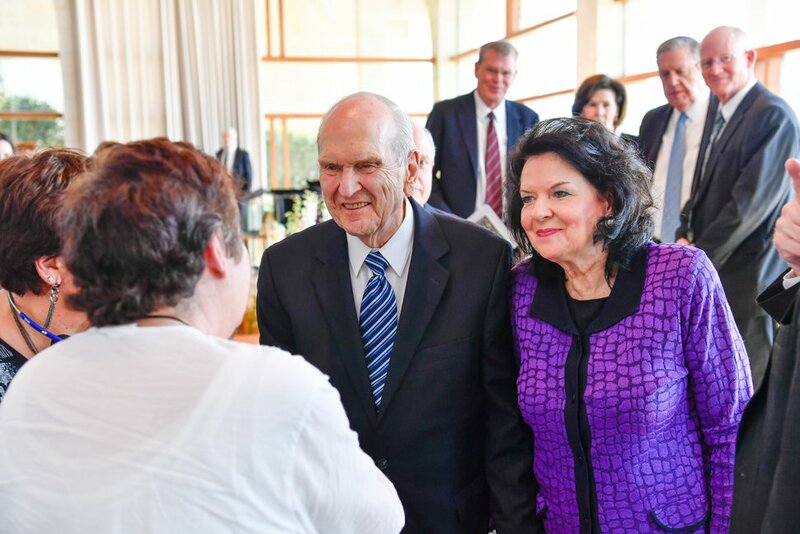 (Courtesy LDS Church) LDS Church President Russell M. Nelson and his wife, Wendy, greet Latter-day Saints at the BYU Jerusalem Center on April 14, 2018.